Business travel is showing signs of moderate but stable growth for the coming year, according to the latest Business Travel Quarterly Outlook – United States, released April 10, from the Global Business Travel Association (GBTA) and sponsored by Visa. The report shows that the business travel market has stabilized, but the outlook for international outbound travel is troubling due to the ongoing uncertainty of the European debt crisis and rising oil prices. “It seems like we can start to breathe a sigh of relief about business travel,” said Michael W. McCormick, GBTA executive director and COO. GBTA research demonstrates that 2011 was a year of growth for business travel. Total spending on U.S.-initiated business travel hit $251 billion in 2011 – up from $234 billion in 2010. This included $111.7 billion spent on transient business travel, $107.7 billion spent on group business travel and $31.6 billion spent on international outbound travel. GBTA research demonstrates that since 2000, the number of business trips taken has declined, while the amount spent on business travel has increased — and not due solely to price inflation. In 2000, 576.06 million trips were taken with a spend of $242.9 billion. 2011 saw the number of trips decrease to 445.0 million (decrease of 22.7%) and spend increase 3.3% to $251.0 billion. In 2012, the trend will continue, as the number of trips dips 1% while spend increases 3.6%. In fact, GBTA research shows that the average spend on a trip in 2000 was $422 and in 2011 it has grown by 33.6% to $564. While inflation alone accounts for 64% of the increase in average spend, the real increases in spending account for 36% of the total increase. The GBTA Business Travel Index (BTI) for Q4 2011 came in at 116 — two points lower than the projected value in GBTA’s last outlook. The BTI is expected to see stable growth over the forecast horizon, reaching its pre-recession high of 120 in 2012 Q3. The index is expected to grow roughly one point per quarter through 2012 before picking up pace in the second half of 2013. This slightly lower index value has been driven by continued uncertainty in the Eurozone, higher global energy prices and continued slow growth in the domestic economy. 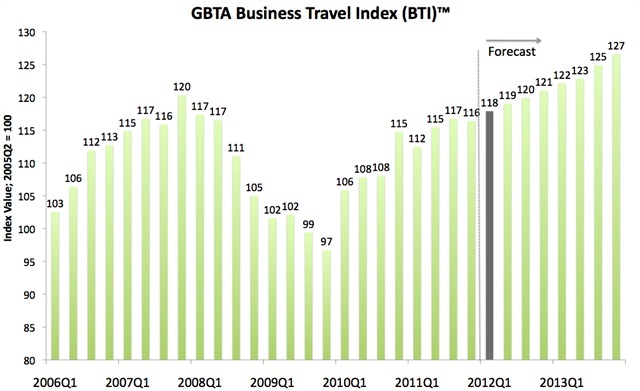 Business travel had a relatively good 2011, but Q4 GBTA BTI finishes just one point above 2010 Q4’s 115, as international economic risks and slow domestic growth have challenged robust recovery. After growing 8.5% in 2011, international outbound travel spend is expected to slow to only 3% growth in 2012. Weaker demand in Europe and Asia has led to the slowdown. The number of total U.S.-initiated international business trips hit 6.78 million in 2011, 3.1% growth over 2010. 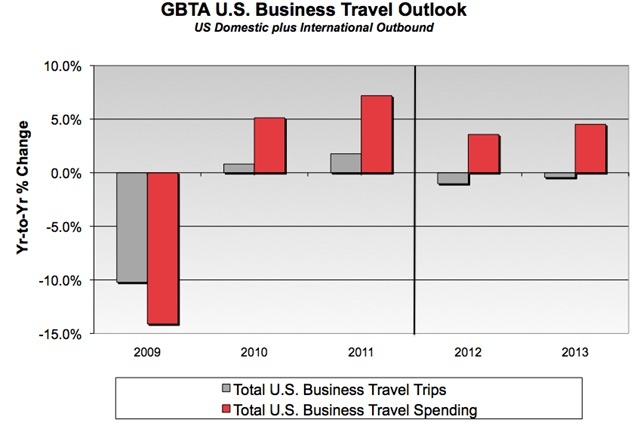 GBTA expects growth in the number of trips to slow to 1.2% in 2012, followed by more a robust advance of 4.8% in 2013. Transient business travel spend finished 2011 very strongly — ending the year up 6.7%, after falling -0.4% in 2010. But this rate won’t continue as GBTA expects growth to be far more modest in 2012 and 2013 (3.7% and 3.9% respectfully), staying in line with the slow-growth pattern of the economic recovery. Group travel will keep pace with transient growth as long as no significant economic shocks take place. Economic shocks disproportionately impacts group travel compared to transient travel. Spending on group business trips in 2011 was up 7.2% over 2010. GBTA projects group travel spending will slow to 3.3% in 2012 as uncertainty in Europe and higher energy prices continue to impact the overall economy. The Business Travel Quarterly Outlook – United States is free of charge to all GBTA Members (gbta.org/foundation/resourcelibrary). Non-members may purchase the report through the GBTA Foundation at research@gbta.org. The Business Travel Quarterly Outlook – United States projects aggregate business travel trends over the next eight quarters. The report includes key buy-side metrics such as total business travel volume and spending, plus supply-side projections of changes in costs, across both transient and meetings travel. This article was updated on April 13 to include the two charts.